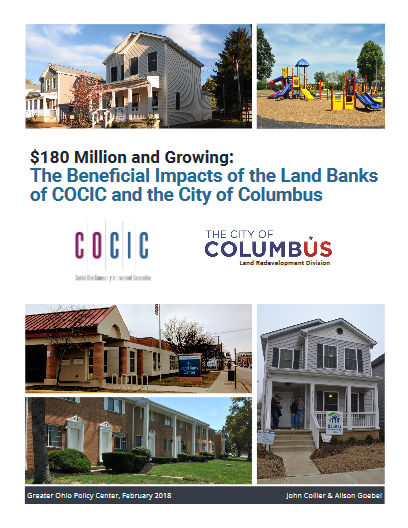 According to a recently released report by Greater Ohio Policy Center, in the past five years, the Columbus Land Redevelopment Office and Central Ohio Community improvement Corporation (COCIC) have generated $180 million in economic impact in Columbus and Franklin County communities. The land banks work together to help create stronger, safer neighborhoods by obtaining and managing blighted properties and creating redevelopment opportunities. The land banks have impacted communities by using more than $38 million with funds from several sources including the State of Ohio, for demolition of more than 1,600 vacant and blighted properties; reuse of 1,300 properties for rehabilitation, gardens or new construction and financed over 100 residential rehabs, emergency stabilizations or new builds. Since 2012, vacant properties have decreased by 40 percent in Columbus neighborhoods and the land bank has seen increased sales for both structures and vacant lots in areas such as the King-Lincoln District on the Near East Side, the South Side and Franklinton. Outside Columbus, the land bank demolished over 750 blighted and vacant apartment units near the Hollywood Casino, which is spurring private investment in the area.